Sherri is Windsor Ontario’s premier newborn photographer and is recognized for her modern, simple, unique yet timeless approach to newborn photography, her mastery of studio lighting and ability to capture connections between families. She understands how important it is to hire a photographer you can trust to provide timeless, heirloom images documenting your Journey through Motherhood. Safety is Sherri’s number one priority is your baby’s safety followed with providing you with a relaxed yet fun and memorable experience that results in beautiful images you’ll treasure forever. It is never too early to schedule your session in order to secure a date on Sherri’s calendar. DO I COME TO YOUR STUDIO? Yes, Sherri has an in-home studio stocked with a wide variety of props and a sitting area where new parents often catch some zzzzzz’s during the session. IS ONE WEEK TOO SOON FOR IMAGES? Absolutely not! In fact, between 5-9 days (14 days max) is the ideal time to photograph your tiny new baby. 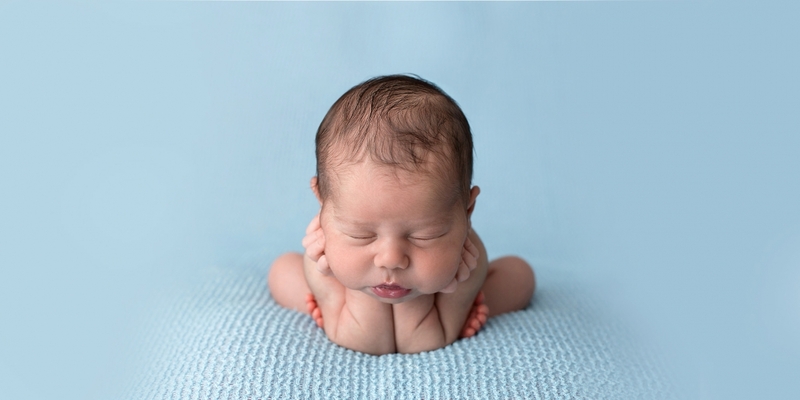 It is within this time frame that your baby is still the most sleepy, flexible, womb-like and most likely to imitate the poses you see in Sherri’s portfolio. Sherri has an ever-growing stock of handmade props from well-known, boutique newborn prop vendors that are available for use during the session. Please expect a relaxing session experience. There is no worry if you aren’t feeling 100% yourself yet. As soon as you arrive for your session, Sherri will take over with soothing, feeding (unless you’re exclusively breastfeeding – obviously! ), rocking, comforting, and posing baby. SHOULD I BUY A SPECIAL OUTFIT FOR THE SESSION? No, this is not required at all. Baby will be photographed as naturally as possible, normally without clothes as they tend to look bulky and awkward in portraits. If you plan on having sibling or parent/family portraits done then you may be asked to bring a white or black tank top or shirt. Sherri will send a detailed Prep Guide outlining how to prepare for a successful session once you secure your session date. Sessions are tailored to the individual newborns. The average session lasts about 2.5 hours, however, if baby requires more comforting and feeding than usual then the session can last up to 4 hours. CAN WE BRING SIBLINGS FOR THE SESSION? Of course. Siblings are always welcomed and encouraged to be included. Sibling images are photographed at the end of the session once baby’s part is complete, usually about 2-2.5 hours into the session. The studio area needs to remain calm and quiet for baby, and it is understandably difficult for toddlers and older children to remain quiet and still while baby is being photographed in a heated studio for several hours. CAN YOU RECREATE THIS IMAGE I FOUND ON PINTEREST? Sherri wants you and your family to have unique, original portraits that reflect who you are. If you see an image that inspires you, she is happy to discuss what is most meaningful to you about the image in order to create something that you’ll love. She won’t, however, re-create a list of Pinterest requests. There is only so much that baby will tolerate during a session and moving from one pose/prop/outfit to another will be unnecessarily disturbing for baby.